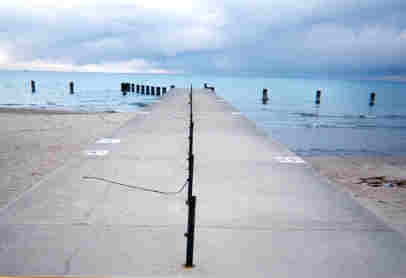 Self-guided field trips to Lake Michigan. See how far down you have to dig to hit ground water, a pebble beach in the City, deposition/erosion and more in this fascinating glimpse of 124 students' interactions with our local landscape. Photos from March/April, 2000. Page created April, 2000. Part I: Observe the Lake. Lisa Do. 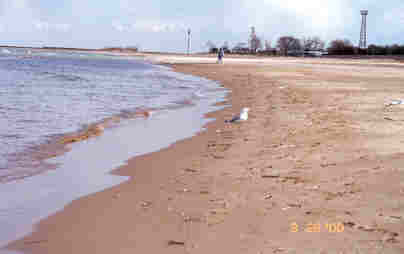 Small waves and gull looking south to a sand spit. Kiennesha Eades. 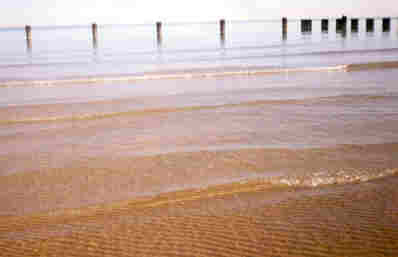 Ripples under gentle waves. Kiennesha Eades. 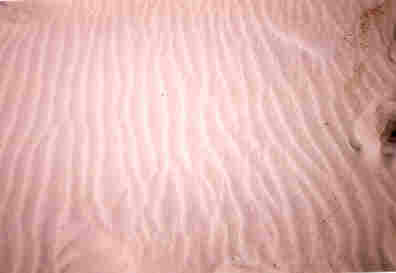 Wind ripples in dry sand. Asia Momin. 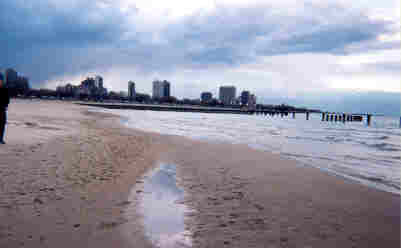 Stone beach at 6000 North. Jacqueline Leanza and Joseph Storelli. Deposition upstream; erosion downstream. Joseph Storelli. 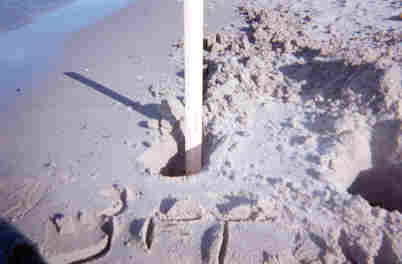 Surface expression of the groundwater within the outermost beach strand. Part II: Find the water table. Pinal Gheewala. 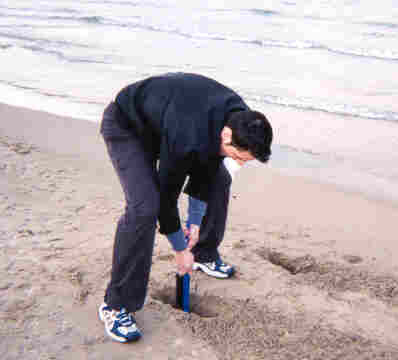 Digging a hole to find the groundwater. Pinal Gheewala. Eureka! 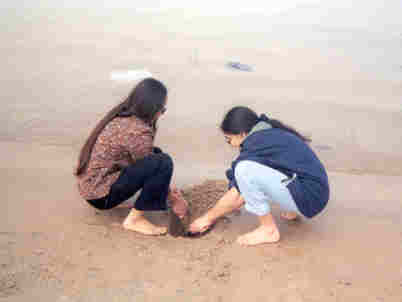 Pinal Shah and Rimpal Shah find groundwater at seven inches. Kevin Gibbons. Three feet from waterline, eight inches down. Nicole Cristofano. Five inches deep, three inches from the waterline. I was very proud of what my students found and observed. For some, this was their first trip to the lake; others were very familiar with it, yet still found new things. 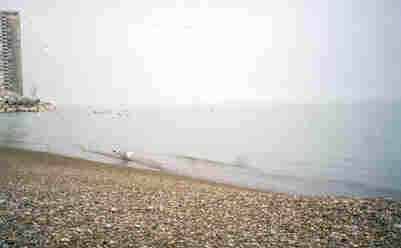 The assignment was to take the book to the lake and attempt to find and document as many coastal processes and features as possible. 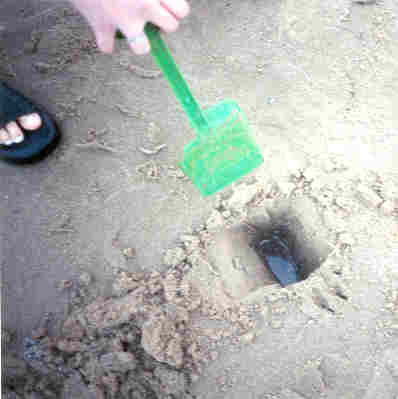 In addition, they were to find the top of the water table, which several of them did in interesting and creative ways. Jacqueline Leanza. Who says you don't need an ice scraper in springtime Chicago?